We are a family owned and operated company. We are located in Brandon, Florida. We serve all of the Tampa Bay Area. 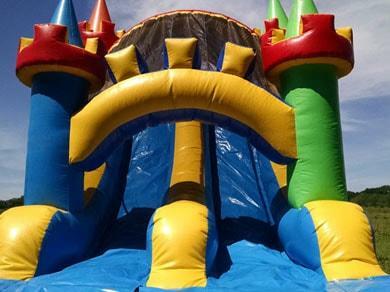 Since 2006 Our Customers have enjoyed Clean, On-time Bounce House Rentals, Water Slides Rentals and Party Rentals. While it's a lot of fun doing what we do, we take your safety and health seriously. Our Inflatables are always inspected, cleaned, sanitized and staked down properly before and after every event. 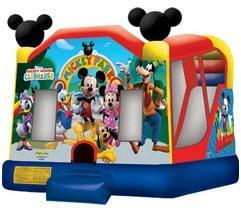 When you rent a bounce house from us you will always get a clean and insured unit, you can also expect great service. 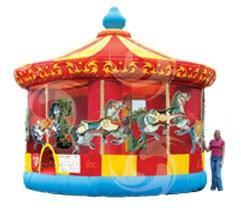 We have Inflatables and rides for every special occasion or event. We also offer Tents, Tables, chairs, concessions and more. 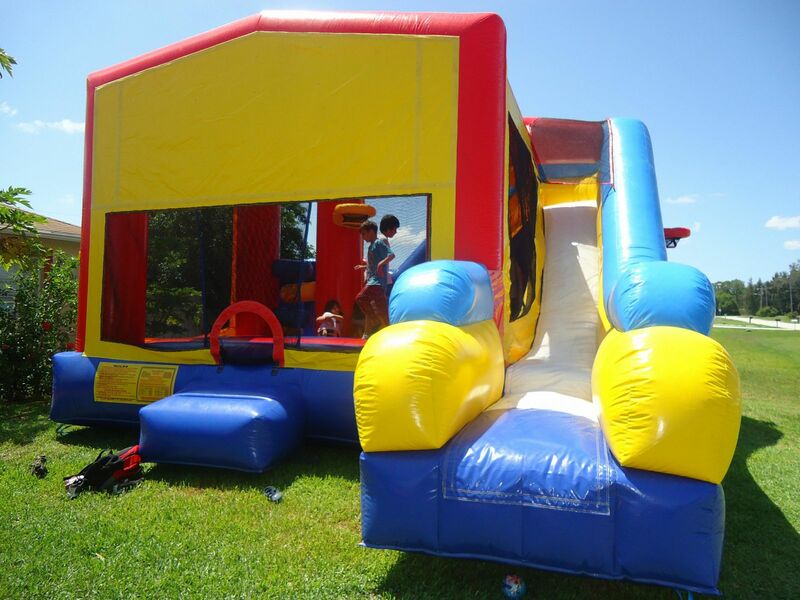 We take personal pride in being able to serve our customers at the highest standard with our Bounce House Rentals and Water Slide Rentals. We work hard to deliver clean, On-time and safe equipment for you to enjoy! 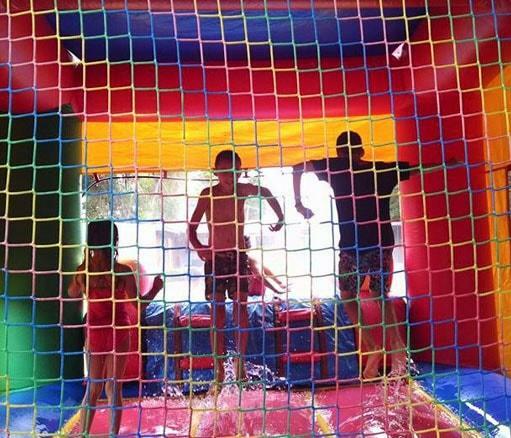 Your family and friends will enjoy our Party Rentals, Bounce Houses, or Water slides for their special event because we carry only the best and most attractive units. Be sure to check out our Interactive games. The best compliment you can give us, is to recommend us to a friend... and we thank you for allowing us to serve you! 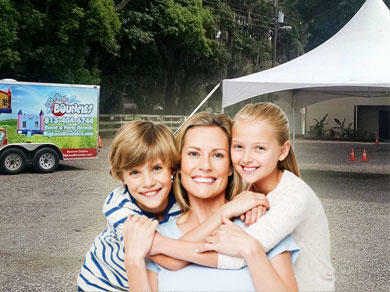 We are pleased to announce that we have a second location North of Us, If you are in the Wesley Chapel, Zephyrhills or Land O Lakes area Go to our Land o Lakes Bounce House company. 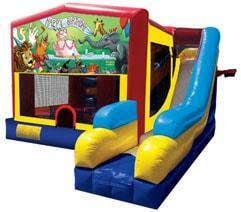 Kangaroo Bouncers is our newest endeavor, check it out and call if you have any questions. We offer services for Company Picnics, Corporate Events and Fundraisers. 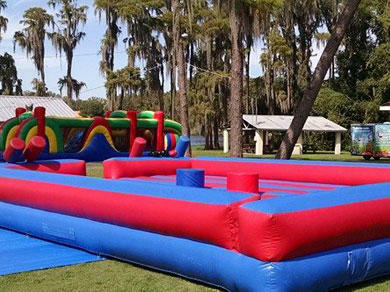 We have proudly served the Tampa area with professional service and the highest quality Bounce House rentals and Water Slide Rentals since 2006. With that, comes the experience to know exactly what it takes to make your event a success. Suggestions, ideas, and recommendations that make your event planning fast and easy. Let us do the heavy lifting so you can relax and enjoy the day. One call get's you in touch with one of our event rental professionals who will work up a plan that meets your fun requirements and budget. As much fun to watch as it is to participate, our interactive attractions can add an excitement level to your event that attendees will talk about long after it's over. Attractions like our dual lane obstacle course is perfect for schools and church group, and large events where maximum throughput is required. Our 28 foot tall rockwall and is the largest rock wall rental in central Florida, and comes with attendants. Planning the attraction layout for your event is easy when you enlist the help of our Professional event planners. We'll make sure you have units that are great for all ages, like our Basketball Shootout. This dual hoop free throw game can have young and old alike, competing to see who makes the most baskets in an alotted time. If your group has fundraising as its goal, then our dunk tank is the classic solution. Just line up the school principal, your local mayor or celebrity to sit in the hot seat and watch your guest line up for a chance to give them the big splash. 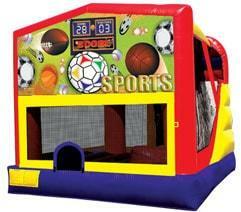 Premium quality Bounce Houses, available in all different shapes and sizes, at amazing prices. You'll find fantastical features, colors, and themes guaranteed to meet any your party's desires and needs. Call today and order a rental! 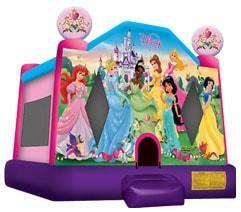 Combo Bounce Houses provide the most popular inflatable entertainment. 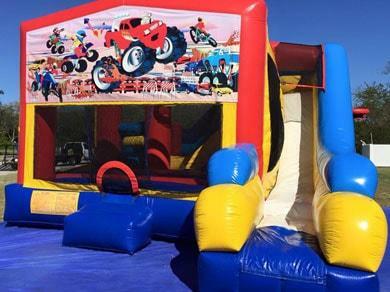 These inflatables combine the popular bounce house feature with one or more exciting elements, such as obstacles, slides, climbing features, or basketball hoops. 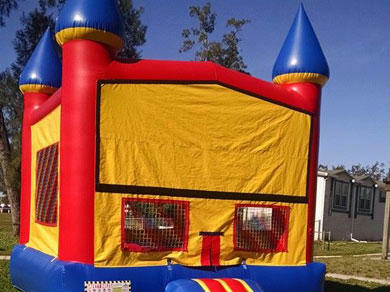 What's better than an Inflatable Bouncy house? The answer is, a water slide rentals. Our Water Slides Come in many sizes and colors. 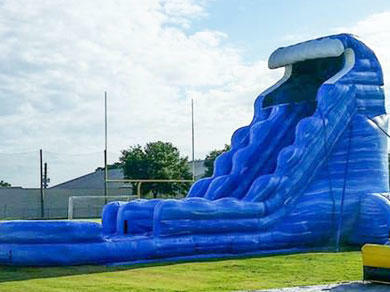 Add water to your inflatable water slide rentals! Have a great time sliding and splashing to your heart's content! The same genius behind water slides applied to your favorite wet Combo rentals. Big Lou's Bouncies has a great selection that is approved for water use. 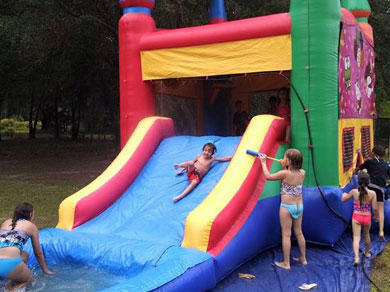 Get obstacles and basketball hoops with your combination bounce house water slides. Double the fun! 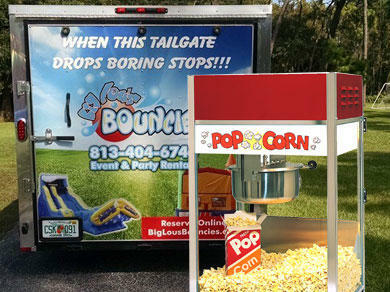 Big Lou's Bouncies has the main event for your party rental. 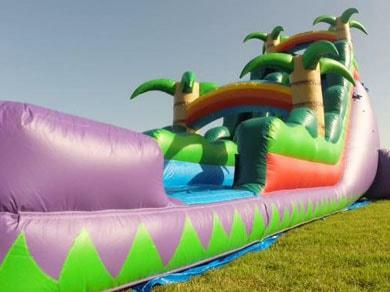 The Inflatable slide rentals are big, saturated, inflatable rentals that bring crowds as soon as they go up. For dry use in areas or circumstances where water is not available or appropriate. 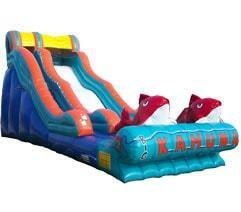 Wet or dry we have an Inflatable Slide that will fit your Event. Tampa's greatest collection of interactive inflatable games! You choose from dunk tanks, gladiator jousting, obstacle courses, and much more. Adding interactive games to your event line up brings guests together with maximum fun! Our Inflatable Game Rentals are big fun for all. Guests love the classic carnival snacks they know and love. Our "Fun Food" is perfect for any celebration and event. Cotton candy, hot popcorn, and delicious sno-cones! Your guests will be lining up for more. Perfect for group fundraisers. Add the smells and tastes to any party with our concessions. If the outdoors are getting hot, our beautiful Tents will add that shade you love. Easy to setup, our versatile tents provide a cool place for your guests to gather in comfort. High Peak Tents are perfect for outdoor weddings and graduation parties. Our Tent Rentals are great for any occasion. We are our customers' most trusted vendors, Approved for County school and parks and recreation. 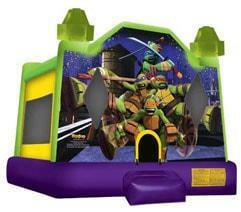 We've created discount party packages featuring all of the best equipment we have at the best prices. Quality and value is why our customers love Big Lou's Bouncies so much. We've been a repeat customer of Big Lou's and have referred them to several of our neighbors & friends. We love Big Lou's- the bounce house and water slides have been clean & bright, the delivery and pickup are timely and smooth, the guys are always very pleasant. We had Big Lou's provide us with a bouncy house for our family picnic at the Univ. of Florida Gulf Coast Research Center in southern Hillsborough County. The kids loved it! Delivery and pick up was perfectly timed. Very easy to deal with! They helped make my child's party a blast! 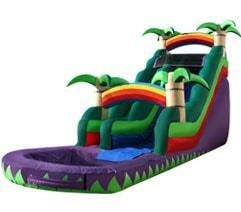 We went with the bounce castle and water slide, Great service, on time delivery, set up and pick up. Professional, friendly and straight forward company. I wish all companies could be like this! An awesome experience with Big Lou's Bouncies! Great rates, set up was quick and efficient. Bounce house was immaculate. Pick up was just as they said quick and clean! Would absolutely use them again. Couldn't be happier! The guys showed up the night before which gave us close to a 24 hr rental. They were quick and explained exactly how to deflate and set it back up for the party the next day. Having this waterslide at my 7 year olds party really made it "the best birthday ever!". We will definitely recommend them to our friends! I would recommend this company again and would absolutely use them again if the need arose. The guys were on time and took great care in setting up the equipment.